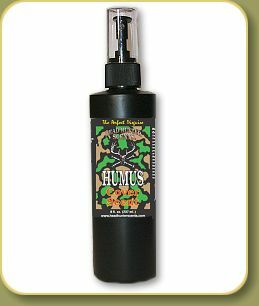 Home > Hunting Sprays / Scent Products > HUMUS Cover Scent 8 oz. HUMUS® Cover Scent The perfect disguise HUMUS cover scent is a oil based product that gives off the smell of decaying leaves and allows you to smell like a part of the forest. It will help blend your scent into the environment and is proven to be 100% effective for masking the human odor. It has been reported from hunters that, when using “Humus”, they have had both big game and predators approach them from down wind with no hesitation. Some were even close enough to reach out and touch! If you’re a hunter or photographer and work from the ground or from high altitudes (air currents can and will take your scent to the ground-no matter how high you get) this product can increase your chances of success. 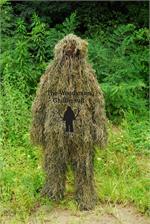 Sprayed on boots, clothing and equipment, this product disguises you against a deer’s best defense....his nose. Use the best cover scent on the market. Available in 8oz spray and 32oz refills.